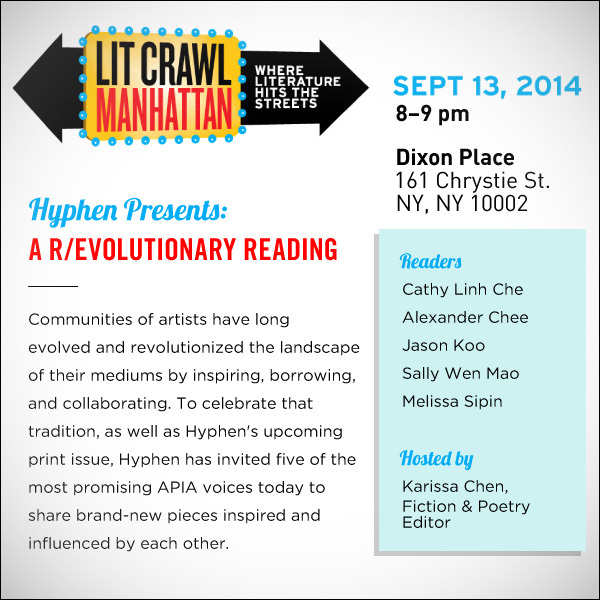 If you're in New York this weekend, Hyphen and Lit Crawl NYC invite you to A R/Evolutionary Reading, a night celebrating the evolution and revolution of literary works as five of the most promising APIA voices share their latest pieces. It's happening Saturday, September 13 at Dixon Place. Communities of artists have long evolved and revolutionized the landscape of their mediums by inspiring, borrowing, and collaborating. To celebrate that tradition, as well as Hyphen's upcoming print issue, Hyphen has invited five of the most promising APIA voices today to share brand-new pieces inspired and influenced by each other. CATHY LINH CHE is the author of the poetry collection, Split (Alice James Books, 2014), winner of the Kundiman Poetry Prize. She is a poet, teacher, and arts administrator splitting time between in East and West Coasts. ALEXANDER CHEE is the author of the novels Edinburgh, and The Queen of the Night, due out in 2015 from Houghton Mifflin Harcourt. His stories, essays and poems have appeared recently in Tin House, the New York Times, The Awl, Apology, and Slate. JASON KOO is the author of two collections of poetry, America's Favorite Poem (C&R Press, 2014) and Man on Extremely Small Island (C&R Press, 2009), winner of the De Novo Poetry Prize and the Asian American Writers' Workshop Members' Choice Award for the best Asian American book of 2009. An assistant professor of English at Quinnipiac University, Koo is also the founder and executive director of Brooklyn Poets, a nonprofit organization celebrating and cultivating the poets, poetry and literary heritage of Brooklyn, where he lives. SALLY WEN MAO is the author of Mad Honey Symposium (Alice James Books, 2014), the winner of the 2012 Kinereth Gensler Award. Her work has been anthologized in The Best American Poetry 2013 and is published or forthcoming in Black Warrior Review, Guernica, Gulf Coast, Indiana Review, Third Coast, and West Branch, among others. The recipient of fellowships from Kundiman, Bread Loaf, and Saltonstall Arts Colony, she holds an M.F.A. from Cornell University. MELISSA R. SIPIN is a writer from Carson, CA. She won First Place in the 2013 Glimmer Train Fiction Open and her writing has been published/forthcoming in Glimmer Train Stories, PANK Magazine, Fjords Review, Hyphen Magazine, and Kweli Journal, among others. She cofounded and is editor-in-chief of TAYO Literary Magazine. As a Kundiman Fiction Fellow, VONA/Voices Fellow, and U.S. Navy wife, she teaches at ODU and Tidewater Community College. She blogs at msipin.com and is currently working on a novel.